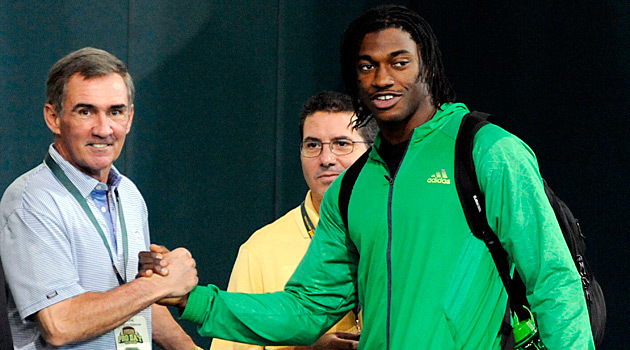 Heisman Trophy winner Robert Griffin III flew to Washington Monday to meet with members of the Redskins staff including coaches and team management. The meetings are expected to take several days. It’s the first time Griffin has visited with members of the Redskins organization in Washington. On Friday the team’s offensive coordinator Kyle Shanahan was in Waco. A source with knowledge of the situation said Shanahan and Griffin reviewed the Redskins playbook during a meeting at Baylor. 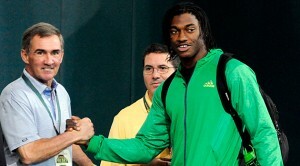 Head coach Mike Shanahan and Redskins owner Dan Snyder were in Waco last month to watch Griffin’s pro day performance. Washington traded three first-round picks and a second-rounder to St. Louis for the No. 2 pick in the NFL draft, presumably to select Griffin because the Indianapolis Colts, without Peyton Manning, are expected to take Andrew Luck from Stanford first overall. We heard the news of Kyle Shanahan visiting with Griffin in Waco, but this is the first mention of Griffin travelling to Washington for a pre-draft visit. There are limits to how many times a draft-eligible player can visit with a team prior to the NFL draft, and how jameshallison casino many players a team can host overall, but neither appear to be an issue as far as the Redskins and Griffin. Since the trade, the Redskins have been locked into selecting either Griffin, or Andrew Luck from Stanford University (in the extremely unlikely scenario where Griffin is selected by the Indianapolis Colts). Many have noted that Mike Shanahan never met with Jay Cutler, prior to drafting him during the 2006 NFL Draft, in a nod to his secrecy for draft preferences. But the Redskins did host Ryan Kerrigan last year prior to the draft before selecting him during the 2011 NFL Draft. 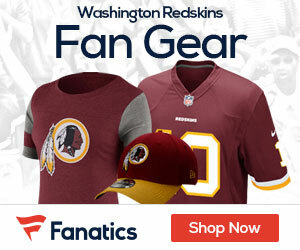 Regardless, the Redskins will be drafting either Luck or Griffin come April 26th. It”s just a matter of which one falls to them at #2.